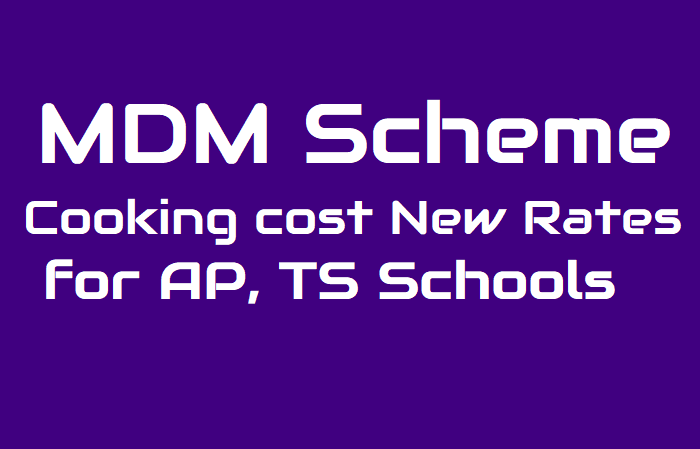 MDM Scheme Cooking Cost New Rates From 01-07-2016 for AP, TS Schools, Mid Day Meal Scheme Cooking Cost Revised Rates in Andhra Pradesh and Telangana States, MDMS Cooking cost rates, National Program of Mid Day Meal Scheme for the year 2018-2019, TS GO.134, AP GO.260, Providing egg thrice a week, Cooking Cost Enhanced /New Rates for PS, UPS and High Schools in AP, Telangana States. Subject: Revision of cooking cost @ 5.35% w.e.f. 01.04.2018 during 2018-19 under National Programme of Mid Day Meal in Schools (NP-MDMS) - regarding. The above cooking cost rates indicate the minimum mandatory contribution by the Centre and State Govemments/UTs. However, States I UTs may contribute more than their prescribed share as some StatesIUTs had been contributing more than their minimum mandatory share from their own resources for providing meals with better nutrition under Mid Day Meal Scheme. G.O.Rt.No. 260 Dated:21-10-2016: Government of AP, School Education - Mid Day Meal Scheme - Enhancement of cooking cost of Primary and Upper Primary and High Schools for Implementation of Mid Day Meal Programme - Orders - Issued. 1. From the Director (MDM), GoI, MHRD, DSE&L, MDM Division, Shastri Bhavan, New Delhi F.No. 11-1/2011-Desk(MDM) dt: 01.07.2016. 3. Rc.No.01/MDM/2016, dated: 11.07.2016, 23.07.2016 & 24.08.2016. 3. After careful examination of the proposal Government hereby enhance the Cooking Cost from Rs.4.86 to Rs.6.13 for Primary Schools and Rs.6.78 to Rs.8.18 for Upper Primary Schools as agreed by the Government of India and Cooking Cost from Rs.6.78/- to 8.18/- for Classes IX & X on par with the Upper Primary Classes w.f. 01.07.2016. This order issues with the concurrence of Finance (EBS.IV) Department vide their U.O.No. 11354/227/EBS IV/SE/2016, Dt: 19.09.2016. MDM Cooking Cost Rates w.e.f 01-07-2016: F .No. 11-1/2011-Desk(MDM), Government of India, Ministry of Human Resource Development, Department of School Education & Literacy, MDM Division. Subject: Revision of cooking cost @ 7% from 01.07.2016 for the year 2016 -17 under National Programme of Mid Day Meal in Schools (NP- MDMS) - regarding. The above cooking cost rates indicate the minimum mandatory contribution by the Centre and State Governments. However, States / UTs may contribute more, as some States/UTs had been doing in the past, than their minimum mandatory share from their own resources to serve mid-day meals with prescribed nutrition. You are requested to disseminate the above revisions for compliance to all concerned and the field functionaries up to school / cooking agency level to ensure prompt implementation of the revised cooking cost with effect from 01.07.2016. This issues with the approval of Ministry of Finance (Department of Expenditure) O.M. No. 13(13)/PF-11/2009 dated 3oth June, 2016.